Who says the best macarons are in France? If you’ve ever been to the Bay Area, chances are you’ve had something baked by the Bay Bread group. Their range of sweet and savory loaves are scattered throughout San Francisco’s best restaurants and shops, and the Bay Bread group has their own mini-chain of bakery-cafes as well: La Boulange. My cousin, sister and I shared coffee and sweets at La Boulange at Fillmore in San Francisco on a rainy afternoon, and the place was packed. I tried my first macarons here, which were almost too pretty to eat. I enjoyed the pistachio-flavored one better than the passion-fruit mango, not only because it was more traditional, but because it was less overwhelmingly sweet. La Boulange also has a selection of soups, salads and sandwiches, but I prefer their breads. Their canelés are also delicious, but I love canelés in general so perhaps I’m biased. 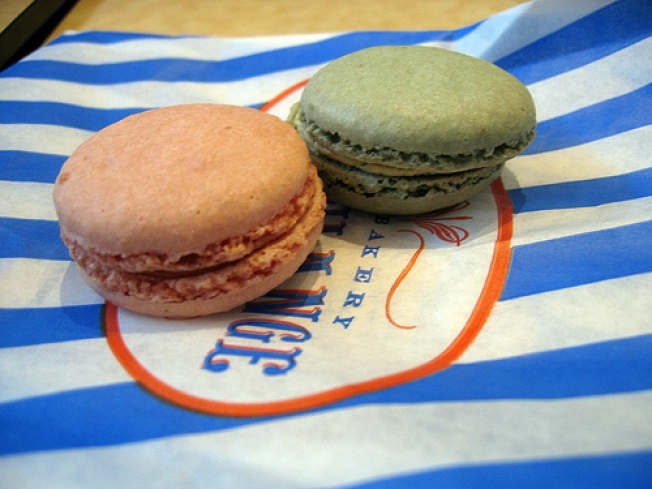 Everyone says the best macarons are in France, but I forgot to try them in Paris. And until I have another chance, La Boulange’s will keep me satisfied.